So I was pulled into the gas station today. I hit the fuel door release button. I heard the click I get out and the door isn't open. I hit the button a couple more times then I decided to kinda pry with my fingers. To my surprise the door fell right off the car and was hanging by the strap that connects the cap to the door. 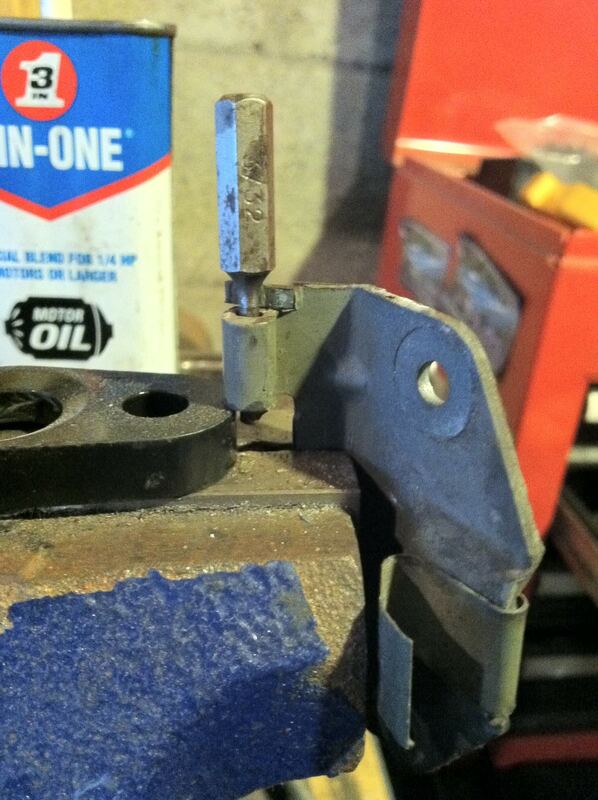 I see that the hinge broke and its a simple repair if I can get the part. So that leads me to my question. 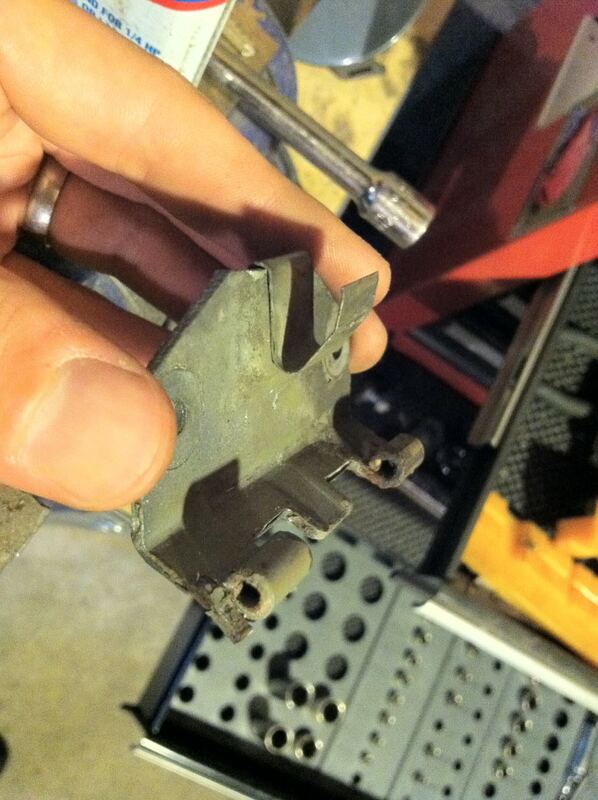 Anybody know the best place to find this part? I'm thinking junkyard would be best but probably low on rivieras. Painting it is not a problem. Thanks for the info. Just google Morads auto parts. They will ship you one, great prices, excellent service. I got a door/hinge/spring from the dealership about two years ago. It was surprisingly cheap. Thanks for the info guys. I was actually able to fix it today. The pin in the hinge is what broke. I punched it out and replaced it with a new pin. Were back in business now. Again I appreciate the info. Lost my fuel door when the hinge pin broke at both the top and bottom ends. Appears to have rusted right thru. Does not look to be easily, or even at all, repairable. I'm not surprised, after having to replace the filler pipe assy 2 years ago due to bad rust issues. Dude that sux! I'm agree with karma should be some way to fix that. The problem will be access, not a pin, at first glance. Dave, just remove those two 8mm bolts that hold the hinge in place and make a pin. Yeah, I'm not saying that replacing the pin will be difficult, it just appears it will be a pain to work my hands inside for installation. I wonder what one of the gearheads at my local GM dealer would say. The fuel door shows with the hinge on the monsterpartsonline.com site but shows as "discontinued." You might want to check with a dealer for "vintage parts" they may in fact be able to get it for you. About $30 - $40. That pin oughta come out with an arbor press and a drift, after you knock off the rust a little, Then you can press a replacement in. IIRC the base of that hinge actually is held on the car with screws. Look close. Yeah, Paul mentioned that up a couple of posts. Ok, door is off. I've soaked the hinge pin with PB blaster for a few hours. This sucker is really rusted in. I do not believe it will drive out, from either the door or the bracket. Time to search for a replacement. Morad has nothing, going to try to check local yards. Can't drive it out, have to press it out or drill it out. I am thinking car-=part.com would have one available -- anyone with a Riv on the lot would be fair game even if they don't list the filler door. For the rest of you - if yours is not rusted yet spray it with lithium garage door lube or some such. Go on V8 and PM George Nenadovich (GStage1). He has gotten me Riv parts. He's in the yards all the time. Give him a shout, he can help. Found one from an ebay seller pending pics. Already posted on V8. Will check local yards when i get a chance. Drilling it out... didn't work well. Can't press it out here. Ok, who can tell me if the 95-97 and the 98/99 door will interchange? They have 2 different part numbers. My first guess might be how they are mounted? I may be able to get a white 96 door, but need to know if it can be used on my 98. Anyone??? Just heard from George. He said he has one for you, and is getting another today. George is the best! Yep, he's hoping for a dry day today to go see the white car. I am still concerned about the differences in the model years. It appears the early ones have a bracket built into the back side of the door, to hang the gas cap on. Mine simply has a notch on the side to hang the strap onto. I likely will need to remove that early model bracket for my use. 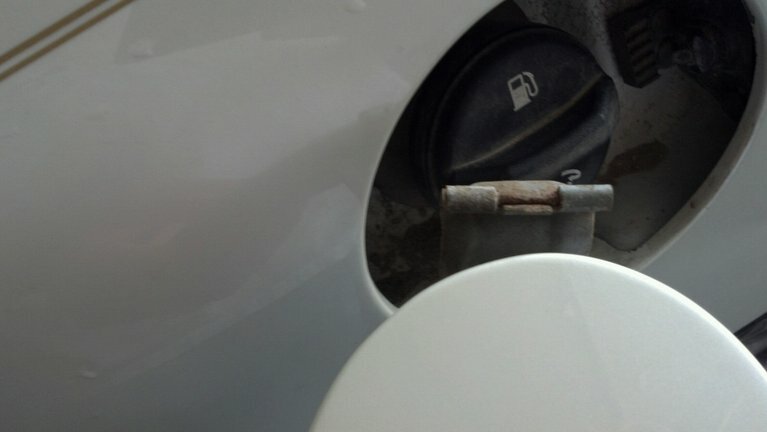 After I replaced my filler pipe a couple years ago, the gas cap now sits right up almost against the back of the door, leaving little to no space for that gas cap bracket. I'll just have to figure out the best way to cut it out. 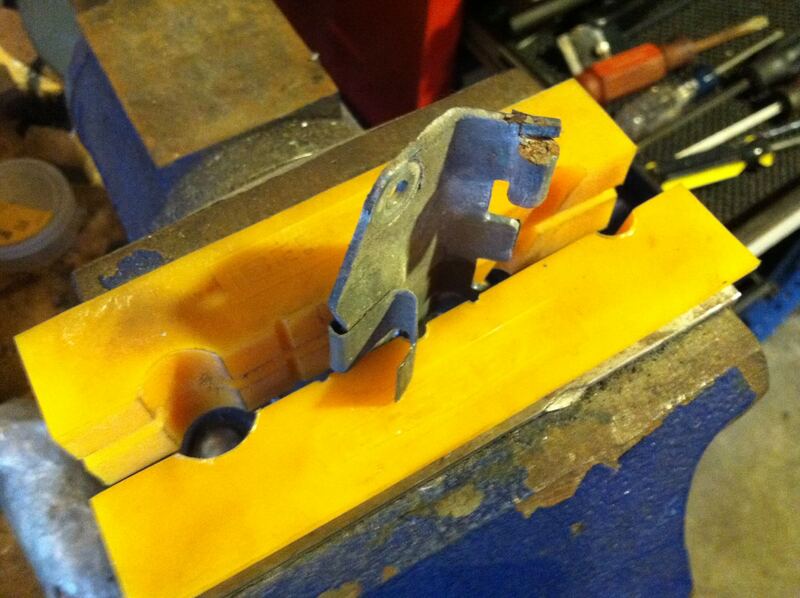 Had to cut off, then grind down, the brackets on the backside. They interfered with closing the door as the new fill pipe and cap are higher up and out than the oem. 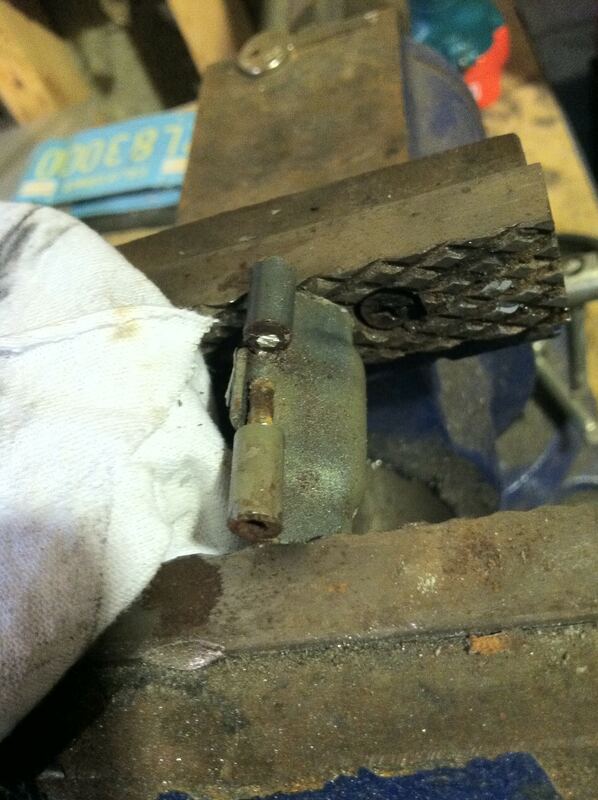 Also had to cut out a section of metal in the lower section of the backside for clearance. But hey for $20, it looks a heck of a lot better than no fuel door. Done. 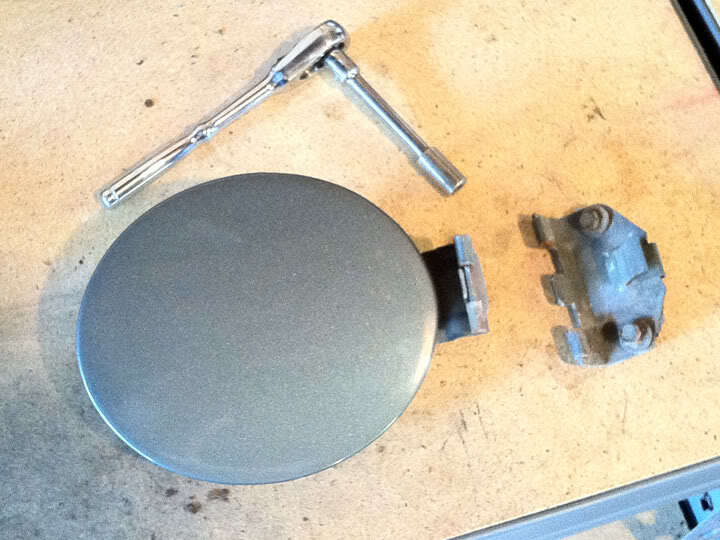 Now I need to clean and protect the hinge parts from corrosion, then repaint them. I will probably use rust converter in a spray can, then paint with a quick dry enamel. I don't really care about matching the color, so it will be probably be black. 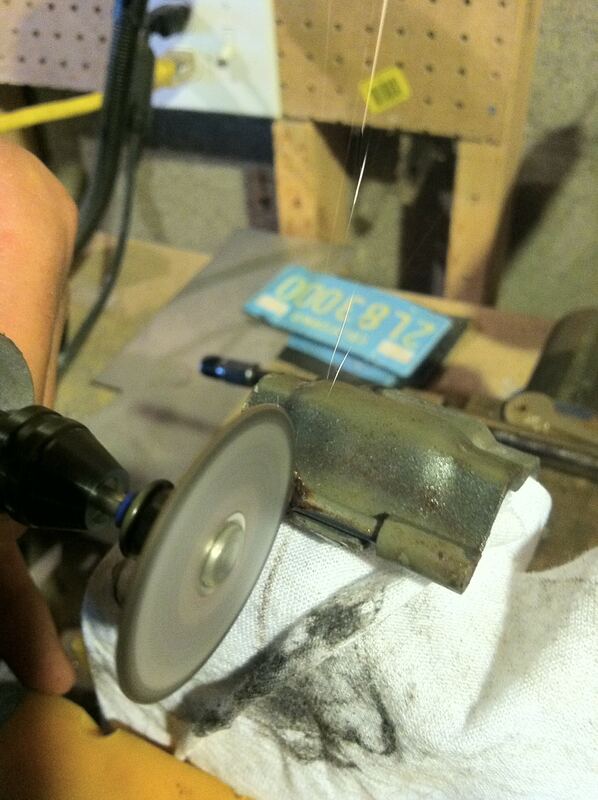 For the hinge pin replacement, I picked up a 1/8" brass rod (3" long), from which I will use just a couple inches. If anyone else is performing this repair, let me know and I'll send you a piece. A brass rod. Cool beans... this won't happen to you twice. And thanks for the writeup!